One wishes for a little more context in this documentary but theres no denying the excitement of one very determined Frenchman doing something so dangerous. 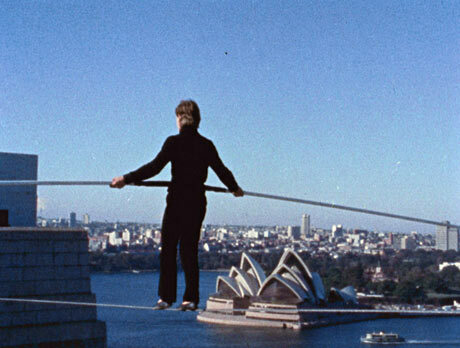 That man is Philippe Petit and in 1974 he had his crowning achievement via a tightrope walk across the now-vanished Twin Towers. The film takes his story as sort of an adventure: excited participants remark on the insanity of it all and the countdown to the big event is presented in thriller-ish reenactments. Were it any other happening, this might not be so exciting but Petits enigmatic flamboyance is fun to watch and the nuttiness of some of the snags, such as the night watchman who showed up unannounced (only to ignore the illegal goings-on), you cant actually write. Director James Marsh just barely avoids A&E theatrics, being at once bound by the narrative of the attempt and success but creative enough to keep it from getting monotonous or dribbling into cheesy hyperbole. Petit is a sufficiently fascinating figure to want to explore deeper, especially regarding his need for death-defying attention and his relationship with shrinking violet girlfriend Annie Allix  many critics have attacked Marshs refusal to penetrate the Petit psychology and account for his behavior. Still, one cant imagine a mythmaker like Petit letting Marsh get very close, and the smiling daredevil committing "the artistic crime of the century is plenty endearing and subject enough for a great night out at the movies.